There are a wide variety of ways companies can build their workforce today. Increasingly, businesses are relying on the independent workforce—the 42 million Americans who work as contractors, consultants, freelancers, side-giggers, and more—to fill talent needs. More than 60% of senior executives say the external workforce is important or very important in increasing organizational ability, operating at full capacity, and developing or improving products and services. However, there are many details that must be taken into consideration when deciding to bring a temporary worker, full-time employee, independent contractor on board. There are rules and regulations that govern the engagement of each type of these workers as well as practical applications to consider. Before deciding on the best type of talent for a particular project or job, it is helpful to understand the differences between each worker. Ask yourself the following questions, or use the infographic below to determine which type of talent is best suited to your company’s needs. 1. Is This an Ongoing Business Need? Full-time employees are often the ideal solution for handling constant, ongoing business needs. With a full-time employee, a manager can have full control the work being performed and control the hours and location of the work. Temporary workers may be helpful in fulfilling a seasonal or short-term need, but they are subject to certain regulations and may require additional fees if retained through a third party like a staffing company. 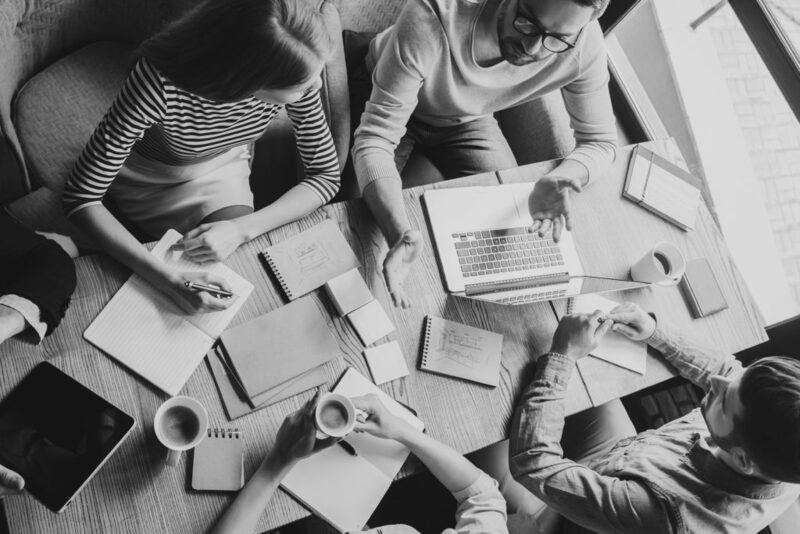 Independent contractors tend to be the most flexible route for short-term project needs, providing access to specialized expertise and a wide pool of talent to choose from. 2. Do You Need Complete Control Over the Work or Project? If the project or work you need completed could be considered a core competency of your company, it should, for the most part, be managed internally with full time employees. You can, however support these core competencies with independent contractor talent as needed. Just keep in mind that control is a key determinate in properly classifying independent contractors. When you engage independent talent, you are managing a business-to-business relationship. Independents have full control over when, where, and how their work is performed. 3. Is the Work or Project for a Specific Period of Time? Independent contractors allow companies to acquire talent for a specific period of time without an ongoing commitment—financial or otherwise. Full-time employees are a better fit for work that is ongoing or unable to be defined. 4. Can the Work be Packaged in Defined Deliverables? If a project or work has clearly defined success metrics and can be articulated into a deliverable, independent talent can be a good option. Independent contractors are responsible for performing the services outlined in a contractor Scope of Work (SOW). On the other hand, if you simply need more people to perform a job that internal employees are already doing, that gap should be filled by a full-time or temporary employee. 5. Is This Need Short-Term? Consider whether your business need fluctuates or if it is constant. If the need is short-term or seasonal, an independent contractor or temporary employee may be the way to go, giving you the flexibility to pay for a resource as needed. If the demand is constant, consider hiring a full-time employee. Independent contractors can be engaged for a long-term project, so long as the project has very clear objectives and can be easily communicated and measured. 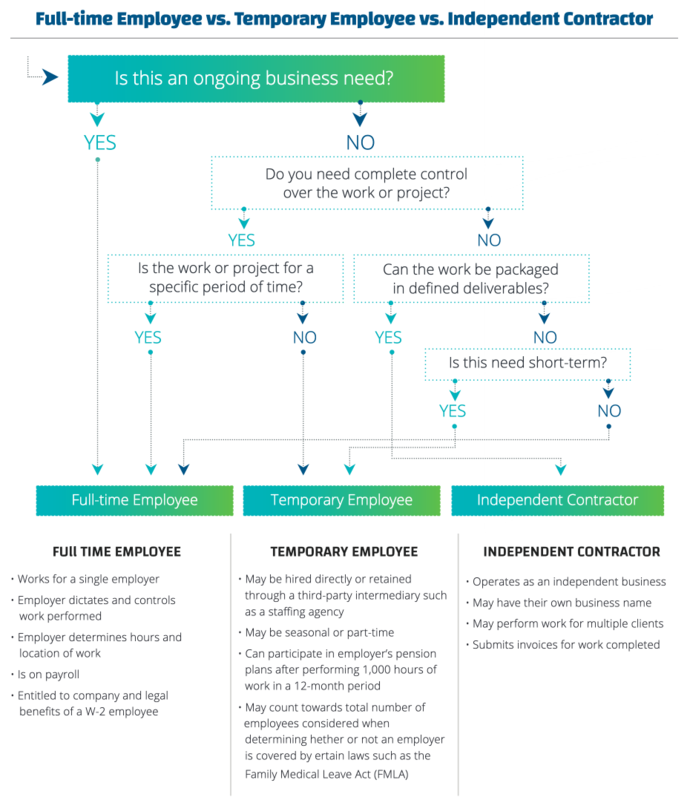 Independent Contractor, Temp, or Full-Time Employee?